Each morning, the familiar chime would tinkle from Chris van Heerden’s iPhone. The welterweight contender left his native South Africa to move to Los Angeles to better position himself to achieve his dream of winning a professional world championship. The 10,355 miles that separated van Heerden from his father and best friend, Daniel, weren’t enough to split a wedge between them. They’d chat about van Heerden’s training progress, and upcoming bouts. They’d talk about family and life and all the things that a father and son share. Like his son, Daniel van Heerden, 61, was once a boxer, and he loved the sport deeply. He was thrilled when Chris signed with former heavyweight champion Evander Holyfield’s Real Deal Promotions. Holyfield was Daniel’s favorite boxer, and he got a kick out of the fact that his son was promoted by the Hall of Fame legend. Then, one day, a few days after Christmas, van Heerden received another call. This time, though, it wasn’t from his father; it was about his father. Peter Kahn, van Heerden’s Miami-based manager, had become friendly with a number of people in South Africa as a result of having managed van Heerden. A few days after Christmas last year, Kahn noticed that some South Africans he’d became friendly with were tweeting to van Heerden. South Africa was nine hours ahead of Los Angeles and van Heerden hadn’t awakened yet. Chris van Heerden had a premonition. He looked at his phone and a photo of his father popped up. He found out the worst news imaginable. Daniel van Heerden, 61, was shot in the back by a security guard following an argument and killed. South Africa has a long history with racial animus and van Heerden’s father, a white man, was shot in the back by a black man. Video of the incident emerged on the internet, though van Heerden refused to watch it. There has been an outbreak of violence between the races, and many murders, which are being referred to in South Africa as “political killings.” In early January, not long after Daniel van Heerden’s death, South Africa President Cyril Ramaphosa vowed to lead an effort to stop them. Van Heerden, as one might imagine, was flooded with emotion. He’d recently signed a promotional contract with Top Rank, and after years of his career stagnating through little or no fault of his own, he’d talked extensively with his father about his excitement about what the future with Top Rank would bring. He is a Christian and said his faith impacted the way he handled the murder. “I was raised by my Dad a certain way, and I’m a man of faith,” he said. “I try to lead by example and I always try to be a good person. Of course, this tested me, but my faith really made a difference. This may sound impossible, but I didn’t have anger [toward the man who killed my father]. I just wanted to know details. Van Heerden, who made headlines in 2017 as Conor McGregor’s sparring partner, returns to the ring on Saturday in Costa Mesa, California, in an ESPN-televised show when he faces Mahonry Montes in a 10-rounder. He said that while he’s been asked about his father a lot, he knew his father would want him to fight. His career has had a lot of ups and downs. He’s 26-2-1 with 12 KOs, with one of the two losses to IBF welterweight champion Errol Spence Jr. in 2015. But he’s only fought once in two-and-a-half years because of promotional problems and other issues outside of his control. He hired former U.S. Olympian Brian Viloria to train him, and Kahn said van Heerden has looked particularly impressive. “He’s been so laser focused and it’s a different Chris van Heerden,” Kahn said. “He lived for the validation of his father. He lived for the praise he’d get from him and he lived to fulfill a dream his father had for him of wanting to see him win a world championship. Van Heerden’s voice cracks as he discusses his bout. Hardly a free moment goes by where his father isn’t on his mind. 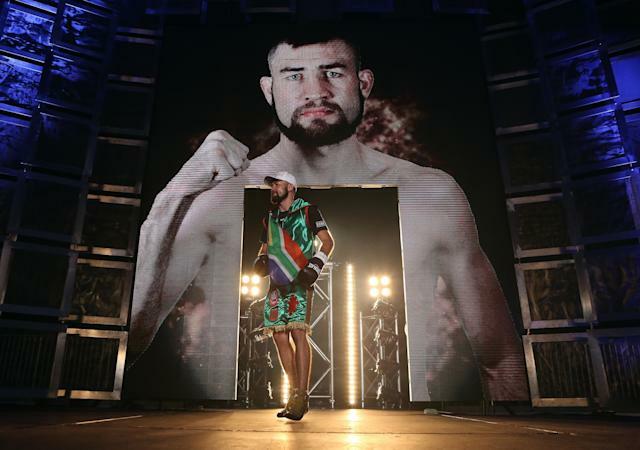 “People are telling me I should be in mourning and not training for a fight, but I know that if my Dad were alive, he’d tell me, ‘Son, go fight,’” van Heerden said. “He knew what made me happy. He knew how much I enjoyed it and he looked forward to my fights so much.